The Crossings: Coming to Bloomfield October 18! Why the Bloomfield Bridge/Liberty Ave/Main St Intersection? 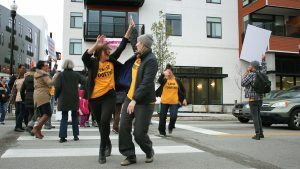 This large and complicated intersection has seen many collisions and close calls, and residents have repeatedly expressed a need to make it more pedestrian-friendly, particularly for those who may require more time to cross. 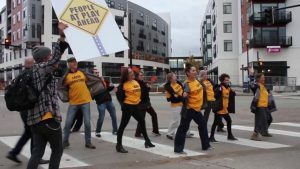 This is especially important since it is adjacent to ShurSave grocery store, the Bloomfield Pool & baseball field, and Woolslayer Elementary School — destinations that attract pedestrians of all ages and abilities, including young children and older adults. 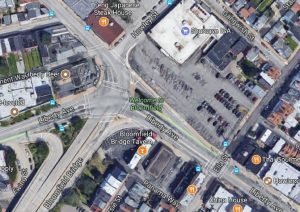 Want to make the Bloomfield Bridge intersection safer? Come dance. 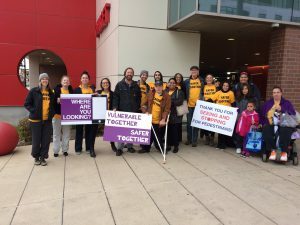 Meet in the ShurSave parking lot at the corner of Howley Street and Main Street on Wednesday, October 18 at 4:00 p.m. RSVP here, or by email to jjablon@livelypittsburgh.com. 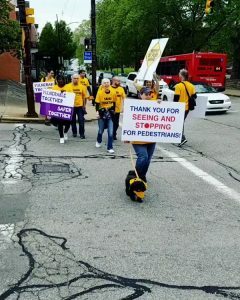 *Age-Friendly Greater Pittsburgh is made possible through support by the Mary Hillman Jennings Foundation and Southwestern Pennsylvania Partnership for Aging.